Today it is difficult to imagine contemporary tattoo without the influence of Norman Collins, better known as Sailor Jerry, the artist who by his professional activity separated the whole tattoo world into two different ages often referred as BSJ (before Sailor Jerry) and ASJ (after Sailor Jerry) (Patrick 2009). Born in 1911, Norman Collins started to tattoo as a teenager and as all other artist of the time used handpoke method. However with the spread of tattoo machines that were sold and advertised through all major newspapers only a few artists remained using handpoke style, following the trends. Same did Collins, who in late 1920s obtained practical knowledge of tattoo machine usage from a Chicago artist Tatt Thomas, already famous within the US. As soon as 1930s Sailor Jerry opened his first tattoo studio in Hawaii. During World War II Collins served as a marine and apart from tattooing in different ports in the Far East also started to develop his interest in oriental tattoos. In the following years he pursued the goal of development of tattoo as separate art form, focusing on a creative value of the designs, part of this pursue was a severe criticizing of contemporary American tattoo artists whom Collins considered to lack talent and copy works of others. On the other hand, Sailor Jerry started to shape the tattoo community by establishing correspondence with some tattoo artists to exchange experience and ideas and who felt sympathy for his aim of establishing tattoo as a form of art. same time, according to some sources, Sailor Jerry still followed his patriotic feelings and by close relations with Japanese tattooers and learning their technique he was trying to “beat them at their own game”, as Collins himself could not forgive the Japanese bombing of Pearl Harbor (DeMello 2007). 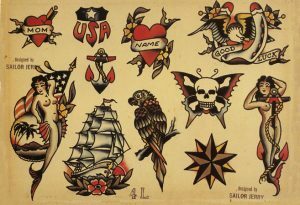 Notwithstanding these rumors, the fact remains that Sailor Jerry contributed to the development of what will be called later American or oldschool style, which he actually worked out borrowing the aesthetic of Japanese tattooing. The use of background as unified part of the tattoo became so innovative in America that the number of followers throwing down their arms in front of Oriental influence was quite modest, however those individuals following Collins became highly influential in world of tattoo. Among them was Don Ed Hardy, who in the following decades set the new bar for tattoo artists and intensively popularized the art.